Upon learning that her class would see a World War I documentary at Century Arden 14 and XD (1590 Ethan Way) on Feb. 6 as part of the World Cultures curriculum, sophomore Erin Wilson was surprised by the cost. “We got popcorn, candy and soda, and we didn’t have to pay for our field trip to the movies,” she said. After all, as a cellist, she is used to paying for the Forum Music Festival that the orchestra, band and choir attend each year. But then the varsity volleyball player remembered that earlier this school year, the team didn’t have to pay for the charter bus to a game in Merced. These differences stem from variations in budgets, sports and performing arts boosters funding and the nature of the trip itself. Day trips, such as the theater excursion, are rare in high school. But World Cultures teacher Bill Crabb, who has a background in experiential education, hopes to change that. “I want (students) to learn by experiencing and visiting places,” Crabb said. So when Crabb decided to show the documentary “They Shall Not Grow Old,” which was not yet available on DVD, to his students, he arranged the trip. According to Crabb, field trips are ideally planned months in advance, but since the theater arranges showtimes only two weeks ahead, he and head of high school Brooke Wells acted fast. Wells said he would like to try out experiential learning more. “Mr. Crabb, (chemistry teacher Victoria) Conner and I are trying to do a few (day trips) with sophomores, maybe after AP exams are over,” Wells said. However, Wells said he isn’t sure if these trips would be funded by the miscellaneous high school budget, which was used to purchase tickets and snacks for the sophomore theater trip. But the difference between the theater trip and other classes’ student-paid trips — such as journalism conventions and music festivals — is that it was local. The school’s proximity to the theater allowed the use of a school bus and thus no cost for students. But for trips with longer distances to travel or more students to accommodate, charter buses are needed, Wells said. “Something huge like a charter bus to Chico sets you back $3,000 (and) has to be planned for or backed by boosters,” he said. Sports and Arts Boosters, Wells said, are separate from the school. The Sports Boosters raises around $15,000 annually, president Jeannie Choi-Boersma said. The Arts Boosters raises “nothing close to that” — between $2,500 and $4,000 — according to Arts Boosters co-president Katherine Merksamer. However, the music and athletic departments also have annual budgets; Wells said he could not release specific budget amounts. Funding for events is covered by a mix of the annual budget, help from the boosters and student fees. But athletic director Matt Vargo said the athletic department funded the charter bus the varsity volleyball team used on Oct. 30 to travel 114 miles to Merced. Vargo said the Sac-Joaquin Section of the California Interscholastic Federation, the governing body of high school athletics in the state, partially reimbursed the department. “Otherwise, I would have gone to the (Sports) Boosters staff for some help,” Vargo said. The bus, which transported athletes and fans, fit in with the “community building and extra things to make our athletes feel special” Vargo said the Sports Boosters covers. Wells said almost every class and elective has a budget. Physical education and athletics have budgets big enough for their equipment, while the English department has a smaller budget as students buy their own books. While the music budget covers the registration fee for the Golden Empire Solo/Ensemble Music Festival at Sacramento State University, neither the budget nor Arts Boosters fully covers the charter bus to the annual Forum Festival (April 13 in Vallejo this year). Merksamer said alleviating the students’ bus cost is the Arts Boosters’ main goal this year. According to band director Bob Ratcliff, in the past, the bus has been paid for in different ways, sometimes from students and atypically from the boosters. High schoolers going to prom and not Great America in Santa Clara after the Forum Festival has helped cut costs. “With all the high schoolers coming back early, we (will) only be billed for half a day on that bus,” Ratcliff said. Though he didn’t know the total bus cost, Ratcliff told Arts Boosters co-president Sue Johnson said it would be under $3,000. Other costs for the Forum Festival are the registration fee, fees per music group and fees per student. There is a $100 registration fee for up to two music groups, and an extra $100 for every added group. 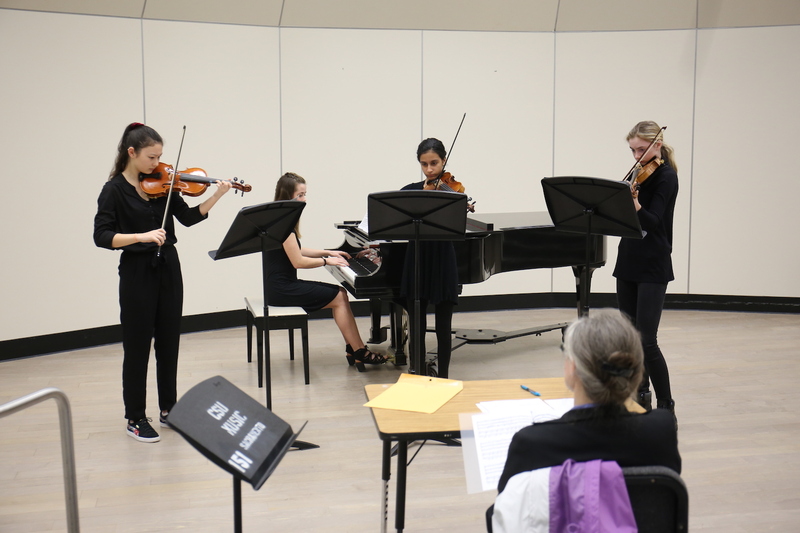 This year there are six groups for the middle and high school music programs. Fees per student, varying yearly, are $39 for the Forum Festival and $63 for the theme park ticket. For high schoolers, the trip costs $45. But Arts Boosters has consistently paid for performing arts T-shirts, according to Johnson. Johnson said that funds for the Arts Boosters come mainly from the Fall Chicken Dinner and the annual Jazz Supper in February. The Jazz Supper has a similar aim, according to Johnson. “We make money off it, but (the event) is ‘friendraising,’” she said. But Merksamer said profit is the Jazz Supper’s ultimate goal. “We obviously are very thrifty with what we do for the dinners — hence the Kentucky Fried Chicken — so everyone comes and enjoys and checks out the arts,” Merksamer said. While the money primarily goes toward transportation to the festival, Johnson and Merksamer said the Arts Boosters will also help with financial aid for the students’ amusement park tickets. Ratcliff said the Arts Boosters and the music budget have been used to cover the cost for some students in the past. “If it’s a financial burden, I’ll work to get them there,” he said. Ratcliff said the Forum Festival isn’t mandatory for students, but it’s detrimental to the band when a student doesn’t come. “In band, there are 32 parts,” he explained. “We don’t have enough people covering our parts. “In order to make the music work, I spend a lot of time tweaking and rewriting music so that all the parts get heard, but that means there’s only one person on a part.